The lightest brake available today, weighing just 75 g per wheel (with pad holders, but without pads, which vary as they wear). The secret behind the light weight lies in the minimalist design and ultra-high specification. The forged arms are thin without giving up strength. Post-style pad holders allow small adjustments in pad height without the need for bulky slots and heavy bolts. Carefully equalized springs eliminate the need for adjustment screws. 1. Direct mounting without washers, with ultralight aluminum nuts for the eyebolts. To adjust the toe-in, bend the arms slightly. 2. Washers that set the toe-in, with thinner steel nuts for the eyebolts. To adjust toe-in, swap between straight and 2.5º angled washers to compensate for the alignment of your frame’s cantilever bosses. Both methods of adjusting toe-in have the advantage of being permanent: You adjust the toe-in once, and then you can change the brake pads without having to adjust toe-in ever again. 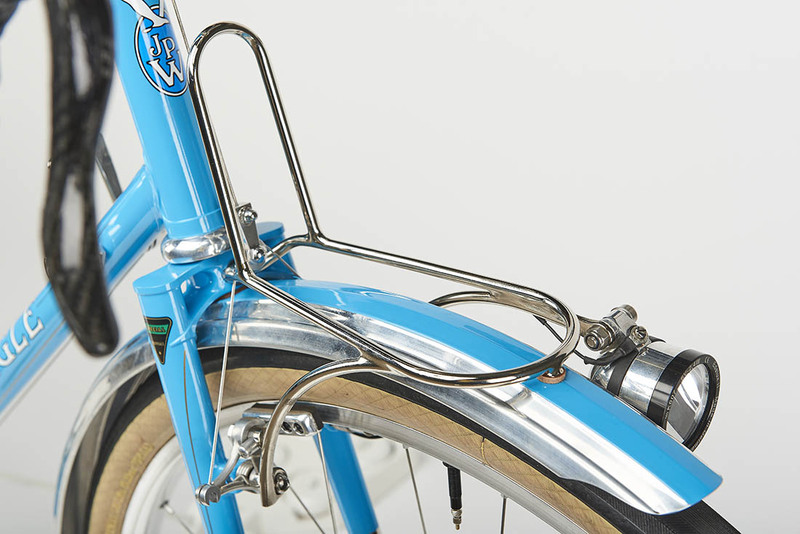 Use the Rene Herse cantilever brakes with modern ‘aero’ or with classic ‘non-aero’ brake levers. Note: To work with the ultralight design of these brakes, the height of your frame’s cantilever posts must be within standard tolerances. (Your current brake’s pads should be roughly in the middle of the slots.) If the pads of your current brakes are at the top or bottom of the slots, the Rene Herse brakes may not fit on your frame. Free worldwide shipping for the Rene Herse brakes. Made in Taiwan and USA. 10 year warranty. Rene Herse® is a trademark of Compass Cycles. Rene Herse introduced his revolutionary cantilever brakes at the 1938 Concours de Machines. Their superlight weight was matched by excellent stopping power, something that was lacking from previous cantilevers. Herse’s first version consisted of two aluminum plates, a design that later inspired the famous Mafac cantilevers used by generations of cyclocross racers. In 1945, Herse introduced his definitive model, with a fine-tuned geometry and a die-cast construction that allowed for even lighter weight. Herse’s brakes were not just for superlight bikes in the Concours; they equipped all his bikes and even tandems. Compass Cycles now has reissued the Rene Herse cantilever brakes, modified to fit standard cantilever posts. The new model is forged for ultimate strength. The shape of the arms was examined using Finite Element Analysis, but Herse’s original design has no stress concentrations and could not be improved. Optional titanium eyebolts for the pads save weight without sacrificing strength – the new brakes are lighter than the originals. These bolts are large to fit over the pad holder post, not because they undergo massive loads, making titanium an ideal material for this part. Using traditional post-style pads allows you to adjust the pad height by sliding the pads inward and outward, without requiring slots in the brake arms that add bulk and weight. The pads can be toed in using an angled washer. Carefully equalized springs eliminate the need for tension adjustment screws, saving additional weight. As on the Compass centerpulls, the straddle cable is extra-thin, made possible by swiveling attachments to the arms, which eliminate stresses that occur with standard clamp bolts.